In 2017, millions of American consumers will be accessing healthcare, and looking to doctors, nurses, and facilities for help and treatment. This means healthcare IT people, processes and systems will be challenged as never before, and IT leaders will need to grapple with many issues in order to fulfill their healthcare mission and put patients first.To meet change effectively, IT leaders are looking to proven methodologies to get more from their IT organizations and technologies. Provide the status of any room and patient at a quick glance. Facilitate pharmacy orders that are accurate, timely and available at the point of use. Enable a single-ordering system for linens and other supplies. Ensure imaging tests and lab results are processed on time, and reported as soon as they are available to the right people. Make it easy for prep staff to complete patient assessments online, and transfer patient data appropriately to the doctors, nurses, and healthcare administrators who need it. Support multidisciplinary bedside rounds, with contemporaneous documentation and order entry. Reduce waiting time, manual and paper-driven processes, and errors. Healthcare IT leaders can get more from their IT-not by adding new or different technology-but by making the most out of what is there already. In order to win in today’s fast paced world, companies must fundamentally change the way they build and deliver software. Especially applications exist in an environment of dynamic business needs and at the same time need to remain stable and reliable, whilst depending on constantly changing environments that support them. The ability to roll out business capabilities continuously will be the difference between companies that can evolve and ones that stagnate. This is the background that is driving the adoption of DevOps. DevOps (an amalgamation of DEVelopment and OPerationS), like most new approaches, is only a buzzword for many people. In broad terms, DevOps is an approach based on lean and agile principles in which business owners collaborate with the IT development, operations and quality assurance functions to deliver services in a continuous manner. Thus enabling the business to more quickly seize market opportunities and reduce the time to include customer feedback into business products and services. DevOps leverages the interdependence of IT development and IT operations to create higher quality products and services. It aims to help an organization rapidly deliver the value sought by the customers of IT. DevOps refers to an organizational philosophy and the professional movement that advocates communication and a collaborative way of working between IT development and IT operations resulting in the fast flow of planned work while simultaneously increasing reliability, stability and resilience of the production environment. Every business wants to move faster without compromising the reliability, stability and security of their systems. And these two seemingly opposing sources of agility and reliability are now possible for every organization to achieve thanks to maturity of DevOps practices and tools. There is a common thread to these points: IT people, processes and technology work in harmony to create value and reduce waste. The harmony is achieved by using a recognized and measurable method called Lean IT. 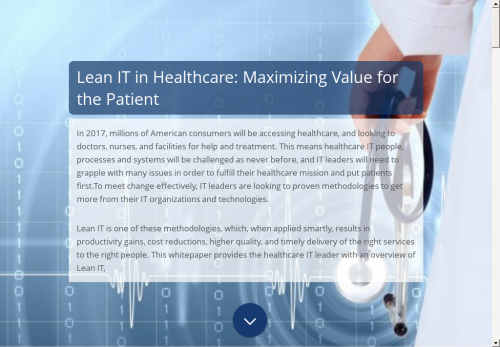 Using Lean IT, healthcare IT leaders can drive greater overall value. It starts with confidence in a proven process, includes rigorous implementation and reliable tracking and measurement, and results in supporting efficient growth and eliminating what no longer adds value. The approach works, and IT clients have delivered improvements to the front line - the nursing staff, physicians and healthcare administrators who use systems to admit, diagnose, treat, and discharge patients each and every day. Service providers and facilities are continuously seeking to improve care quality and timeliness, challenging current systems and operations, and requiring new standards of interoperability as technologies are introduced. Health and social care records are making a profound shift from manual processes to electronic recordkeeping, raising digital security issues and putting health data and fundamental business processes at risk. The Affordable Health Care Act has enabled thousands of new patients to access doctors, nurses and facilities, affecting load and bandwidth throughout the IT infrastructure. Disruptions in systems that cause unreliable care and longer waiting times. System changes and work-arounds that result in duplication of effort and service delays. Budget constraints due to mounting costs that compromise the quality of IT support today, and readiness for future innovation. IT is faced with a question: How to manage its infrastructure and workforce capacity to deliver on its mission? When well executed, Lean IT transforms how an IT organization works, and maximizes the value of its people, processes and technologies, while eliminating waste. First, let’s take a step back. What do we mean by Lean? Lean is a proven methodology that delivers value to customers, and enables continuous improvement. Value is defined by the customer, and represents the requirements that a customer has regarding the product or service delivered. The value is delivered through a value stream, which is the end-to-end process triggered by the customer that ensures the delivery of the required value as quickly as possible. The value stream is optimized through a deliberate flow, meaning activities follow each other with minimal interruptions. Lean aims for perfection, which fosters a culture of continuous improvement. The Lean principles are directly applicable to IT. The key question is: How can the IT organization continually provide value to its customers, so that they can provide value to their customers? After all, IT is an enabler, helping others to increase productivity, quality and timeliness. That is why understanding the key value streamsis critical to the Lean IT process. To achieve this, we start with the fundamental question: Who is the IT customer? The best answer is to focus on the person who is actually delivering the results for the whole organization, and how they are satisfying the requirements of their customers. These frontline people are the ones who use the IT service to fulfill the larger mission, and generate value. And it’s useful to spend time with this concept, and distinguish between customers, end-customers, middle managers, and more users. In the case of healthcare IT, however, we’ve seen some trends. And we recommend that the focus should be on nursing staff, physicians, healthcare administrators and others involved in the primary processes of admission, diagnosis, treatment and discharge of patients. “Advise me on how I should use new IT stuff or make better use of my current IT stuff”. The first value stream is about delivering faultless IT service, based on what is in place currently. This includes avoiding crashes, slow downs, disruptions, or delays. But it’s not always possible to be perfect, and if the IT service does not perform as required, the IT organization must act instantly to resolve the interruption. Along with establishing this level of service excellence, the IT organization should design service maintenance in a way that doesn’t require significant investments of people or time. Incident-free service has real value to an IT customer. IT organizations, however, often follow procedures that perpetuate inefficient IT services, and enable incidents to be prolonged. This is because the value stream is not well defined, and better performance for customers, with less waste, is not well articulated within the IT organization. Delivering new functionality is the second IT value stream. Generally, improving services and introducing new functionality involve customers and, therefore, are highly visible activities. These activities need to be carefully managed because the customer continues to experience an inefficient process until the improvement is delivered. It is critical that IT organizations get this value stream right. If not managed properly, the customer feels an increasing level of frustration and impatience, which could impact the desired results. This means taking steps to put attention on the customer, and actively managing a process to introduce improvements or functionality quickly and faultlessly. The third and last value stream is focused on advising customers how they can use IT to improve their results. This is where intimate knowledge of both IT development and business processes meet, and having insight is helpful. That said, it’s not mandatory that IT have expert knowledge of business processes. For example, in healthcare IT, IT people aren’t required to understand diagnosis or treatment plans. Nevertheless, this value stream puts important demands on the IT organization, such that IT people need to develop the capacity to be flexible and creative, the ability to listen to the customer, and the skills to harmonize systems and technologies with customer needs. Navigating each value stream is a complex process, encompassing data collection, end-to-end process identification, and an in-depth analysis of strengths and opportunities. The pay off, however, is significant. The results of this work accurately reflects the unique set of circumstances for each IT organization, and equips IT leaders with critical information to better manage their people, systems and technologies. The methodology of Lean IT when applied to the healthcare setting offers immediate benefits in terms of efficiencies. It empowers IT leaders so that they can fully utilize technology and application application functionality to deliver the highest service levels and value. It also enables the healthcare IT leader to establish a culture of continuous improvement that will enable ongoing adaptation for future business needs. Most importantly, Lean IT enables healthcare IT leaders to keep the patient first.